For me, the best part of traveling is tasting the local cuisine. Coming to Thailand was always on my list of ‘Must Go’ places because of the food. In the States I would enjoy the occasional curry, and even made a few myself from pre-made curry paste packages. Never did I imagine all the different flavors found here. Honestly, I’d have to say that it’s a Flavor Explosion with every meal. Two times a day I eat some sort of curry: Green, Red, Yellow or Massaman. Before coming to Thailand I would have said that Green was my favorite, now it’s most definitely Massaman. I can’t only brag about the curries, because most of the Thai food is equally as wonderful. Massaman Curry – “Muslim Man” Curry is originally from Persia, but the Thai people have been perfecting (at least I’m guessing because it tastes soo darn good) this recipe for a long time now. It is made with peanuts and potatoes. That sounds weird, I know, but trust me it’s amazing. 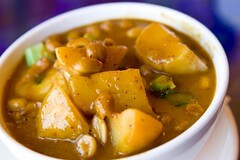 This curry is usually eaten with chicken or beef, chicken being my favorite. Rice baked in a Pineapple – This is usually served with shrimp. The rice and a few other veggies are baked right in a hollowed out pineapple. I love pineapple even more when it’s warm. This is a real treat for me. Thai Spring Rolls – I specify Thai spring rolls because they are made with rice paper, where Vietnamese Spring rolls are made with flour. Usually they are vegetarian, but they can be ordered with any kind of meat you prefer. I’ve only eaten the vegetarian ones, and they’re fabulous. 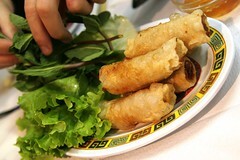 Plus, spring rolls are served with an orange sweet chili sauce. It’s similar to the Duck sauce you get at Chinese restaurants back home. Fried Rice with Chicken – I’ve had this a few times and it’s different everywhere I go. The fried rice is very different from the typical fried rice varieties I ate in the States. This dish is the most simple of my favorites. It’s a good choice because you can add your own spice and sauce to suit your mood of that particular meal. In Thailand, there are usually four condiments on the table at all times: sugar (in case you like your food sweet or it’s too spicy for your liking), crushed red peppers (for even more kick), vinegar/soy mixture (don’t know the name but it’s used instead of salt), and a clear spicy sauce with chili bits (this one is super hot!). This is what's on every table. This entry was posted on February 12, 2010, 11:04 pm and is filed under Food, Thailand. You can follow any responses to this entry through RSS 2.0. You can leave a response, or trackback from your own site. Tropical paradise!! Such natural beauty to behold. Thanks for sharing. The food looks yummy. I will tell Geri about the fried rice and pineapple. She will like it but I dont think she will care much for the giant bugs her son ate. I loved the picture of him eathing the grasshopper. Where is the pic of the bugs while he was chomping away? I want to see that! And to think I couldn’t get Seth to eat anything green growing up!!!!! I bet you ate more than your mom knew about.These pictures always make me hungry.I am so jealous of your adventures but proud of both of you.Love you.